J.J. Pearsall pitched eight seasons in the Dodgers, Reds, Rangers, Tigers and Marlins organizations, going 49-35 with 20 saves. Now a youth baseball instructor in upstate New York, he kindly answered my questions about baseball cards. 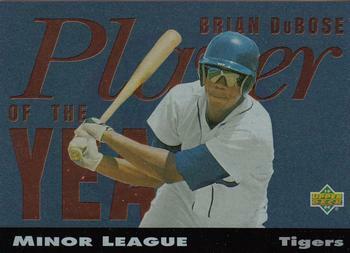 "I held 3 bats on my Tulsa Drillers card even though I am a pitcher, thought that was funny. My favorite one would be my Portland Sea Dogs card, I only have one of them!" Thanks! Unfortunately I could not find a picture of either one. This one is from the San Antonio Missions. "We were both playing second base that day - and this was the very beginning of the season - I believe our first series of the year... And yes, he charged a chopping ground ball and it drilled him right in the mouth. I remember that a few people were looking for the tooth for a while, but we could not find it. Probably, the tooth came out of his mouth covered in blood so when it hit the dirt it was instantly covered in dirt and there was no way to see it. By the way, the field was not very nice in Augusta and we actually wore mouth pieces for a while after that game (I doubt Chris knows that). Anyway, he was with the Charleston Wheelers and we were in the Southern division - Augusta Pirates, we did not play them for a LONG TIME again.. it was the second half, July sometime.. so a long time had passed. Now back to the tooth.. It was a month or so after the incident that I found the tooth. He had this correct,.. just after the national anthem I would look for any rocks to grab off the field - more like a ritual, and I look down to see this long white, shiny rock.. and I pick it up and sure enough, there is the tooth - super long root. I put it in my locker and purposely brought it up to West Virginia to give to him. If I remember correctly, they won the Championship that year - and here is another tidbit.. Trevor Hoffman was the shortstop (Chris played 2nd that year) and of course Trevor became an AMAZING pitcher and had a great career as a closer. One last thing, at this same time, Pittsburgh had a minor league infielder who also became an pitcher.. Tim Wakefield! What a career he had as a pitcher." Thanks! There is a card of Hoffman in the same set that I got my Chris Gill card. "After I took the ball off the chops, the paramedics came to take me to the hospital for immediate oral surgery, but as I was standing there, before getting in the ambulance, blood everywhere, I kept saying to them, "I lost a tooth, I lost a tooth," but my teeth were so mangled, they couldn't tell that one had actually popped out (went through my lip). So the other players started looking around for my tooth in the dirt but couldn't find anything. This was in Augusta Georgia, Pittsburgh Pirates affiliation, first week of the season. So they continued the game as I went on to the hospital. Two weeks later, when the Pirates came up to play us, their SS walked up to me and said "You're never gonna believe this. A few days after you guys left, I was out at SS and kicking the dirt around during the National Anthem. As I looked down, I saw this really cool rock, so I picked it up. As I took a closer look, I knew right away what it was, it was your tooth." My whole tooth came out clean. It was hilarious, I couldn't believe it. Still have that tooth to this day." Thanks! That shortstop was likely Austin Manahan, who has shared several stories with this blog. 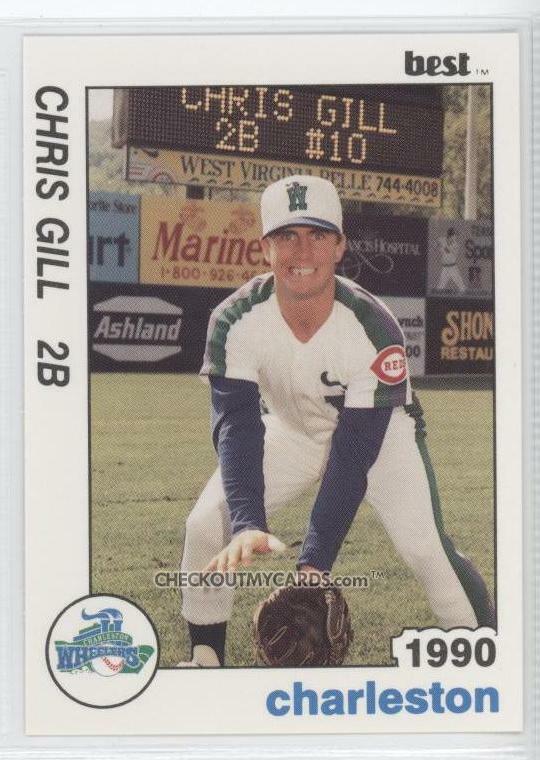 Infielder Chris Gill played four seasons in the Reds organization, hitting .244 with 3 HR, 99 RBI and 43 SB. He is now involved in baseball in a very different way, as Senior Producer of MLB The Show for Sony. He kindly answered my questions about baseball cards. 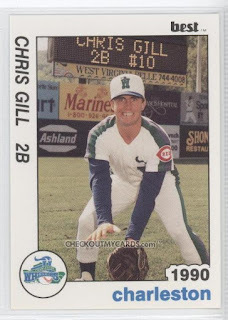 There's a card where I'm in an infielder's stance when I was playing for the Charleston Wheelers, I think around 1990. You can see I'm posing with a huge smile. That's because about a few weeks prior to the picture being taken, I was drilled by a bad hop in the mouth and bashed my teeth in. I ended up loosing a tooth so if you look closely at the card, you can see a big gap in my smile. I would have to say the one with my tooth knocked out. It's just kind of funny. Thanks! I don't have that card, but here is one I do have, from 1989 ProCards. 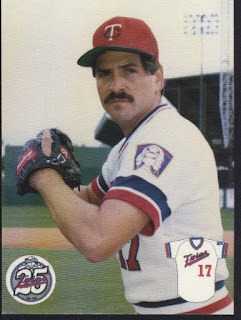 Dennis Burtt pitched fifteen seasons of professional baseball, going 121-99, including a 2-2 record in the major leagues with the Twins in 1985 and 1986. Now a Registered Representative at Transamerica Financial Advisors in Lodi, CA, he kindly answered my questions about baseball cards. "I never really collected baseball cards. Actually I have just a couple of balls I've kept. I used to get autographed balls for the son of a friend of mine. He had a lot. After I started playing I moved so much I didn't have any place to keep anything. I guess my favorite card is the one put out by a cereal company in the Minnesota area. I say that because it is the only one that was made. It was a few years after I played in Minnesota that we were looking for a card. My wife had the ball from my first win and she wanted to put it with my card. I called Topps and they said they didn't make one of me. They checked and told me Fleer didn't make one either. I asked them why they didn't make one (since I signed a contract with them my first year) and they said "We didn't think you were going to be there." Needless to say I was very disappointed." 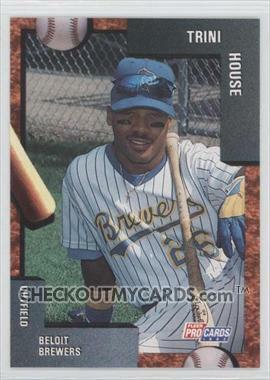 Outfielder Trini House played two seasons in the Brewers organization, hitting .295 with 13 HR, 89 RBI and 21 SB in 165 games. Now a youth baseball coach in Maryland, he kindly answered my questions about baseball cards. "You can find a few of my cards on the internet. A Bowman gold rookie card under the name Howard House and a few others under the name Trini House." "I'm looking for the Upper Deck Player of the Year card 1994? I don't collect cards just recently wanted to find old cards of myself." I don't have this card, but maybe one of you readers do? If you have this one or any others that you want to send him, let me know and I will forward your info on to him. 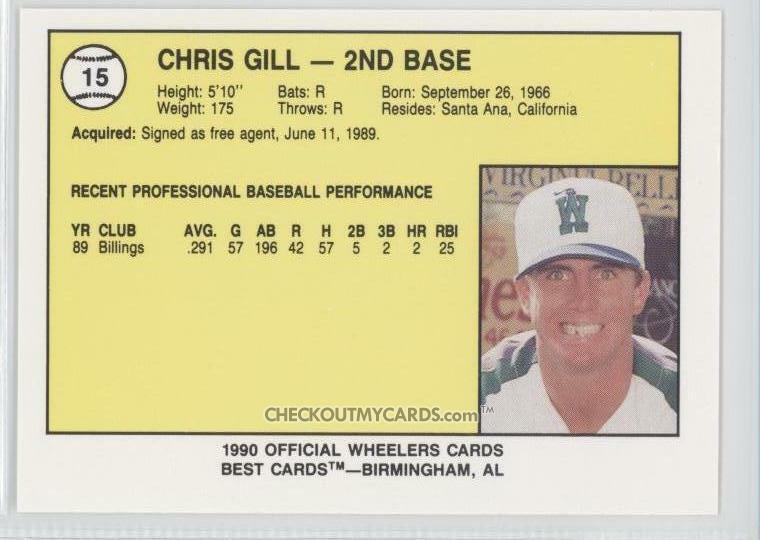 I don't have that card, but I do have his base card from 1994 Upper Deck Minors. Another set from 1987 ProCards. A lot of these sets were from teams pretty low in the organization, so a lot of guys with very short professional careers, and a lot of players with organizations I never knew they were with, like Juan Guzman, who apparently started his career in the Dodgers organization. 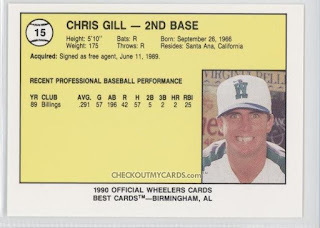 All of these cards were taken in front of an outfield wall filled with colorful advertisements, which leads to some interesting backgrounds, but also leads to every single player in the set having his face in shadow. Fred Farwell cuts up a bit on his card, really the only one to show some personality in the set. Another of several 1987 ProCards sets. I love the team uniform, reminiscent of the Mariners uniforms of the time. Jose Tartabull Sr. and Deron Johnson Sr. were teammates on the 1962 Kansas City Athletics. This set contains a real mystery card. Anyone recognize this guy? The back is no help. The Trading Card Database says it is Tim Erickson, but it's not him, he was the trainer, a fat white guy. Check Out My Cards says it's Jim Bowie, but no, this is Jim Bowie. I've checked every other player who played for Wausau in 1986 and 1987 and don't think it is any of them. Anyone know who the mystery guy on 1987 ProCards #1152 is? Willie Mueller pitched nine years of professional baseball, reaching the major leagues with the Brewers in 1978 and 1981, going 1-0 in six major league games. Now an assistant coach at Concordia University, he kindly answered my questions about baseball cards. Did some crazy stuff while doing them made people laugh. I like the older ones like the 50's, 60's, 70's. 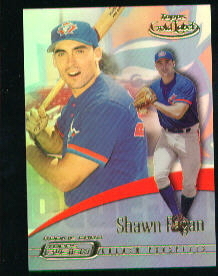 Shawn Fagan, a native of Levittown, NY, played five seasons in the Blue Jays organization, including two years at AAA. In 556 games he hit .281 with 39 HR and 276 RBI. Now Principal Academic Advisor in the athletic department at Temple University, he kindly answered my questions about baseball cards. I was assigned to the Queens Kings (now the Brooklyn Cyclones) upon being drafted in 2000 and shortly thereafter Topps came to St Johns University (where we played our home games) for a photo shoot. Since Topps wanted us outfitted in "Pro" uniforms I had to borrow my manager (Eddie Rodriguez's) jersey and in my Topps Fusion Card you can see the "R" on the back of the jersey in the photo since Rodriguez is a considerably longer last name than Fagan. I always wondered if baseball card collectors/enthusiasts ever picked up on that. Another cool story is when my best friend introduced me to a friend of his who was a baseball card/memorabilia collector. One night we were over his house and he gave me a box of unopened Stadium Club cards to see if I could open a pack with my card in it. I think it took half the box or more but I finally opened a pack with my card in it and it was a pretty surreal feeling. My two favorite cards of myself are the 2001 Topps Stadium Club (this was my first card) and the 2001 Topps Gallery (because it was a portrait). I did collect baseball cards when I was younger and still have all my old cards but I haven't collected in a long time. I believe the last year I collected was 1990 or so. This is the one Yankee set I got in the lot, the first of several sets from 1987 ProCards, which features a simple, clean design. It's cool to get cards of players in a Yankee uniform who I don't come across every day. Even cooler when they were major leaguers for other teams but not the Yankees. I didn't know until I got this card that Braves Manager Fredi Gonzalez was a Yankees minor leaguer. Brooklyn native Maurice Guercio's daughter is a singer on the television show "The Voice". Here is the AAA team for the Chicago White Sox. A very colorful card set. It's fun to get new cards of guys like John Pawlowski or Rick Rodriguez (pitcher with a bat!). If your collection is limited to just major league cards you might only have one or two cards of these players. It's fun to see them in a new pose. The late Moe Drabowsky was one of the most colorful characters in baseball. Very cool to get a card of him. It looks like the Classic and Best companies must have merged in 1991, because instead of Best cards, you get Classic Best cards for the next couple of years. The set is similar to the main Classic Best set, though with a black line at the bottom with the player's info. The pics in the set are pretty generic and are all against the same background. For most of his twelve-year pro baseball career, whenever Matt Whisenant was sitting in the bullpen and heard a call to "Get Whisenant up," it referred to him. Except for his year in Batavia, where there was a pitcher named John Whisonant. Chipper the Clipper really needs a bigger shirt. 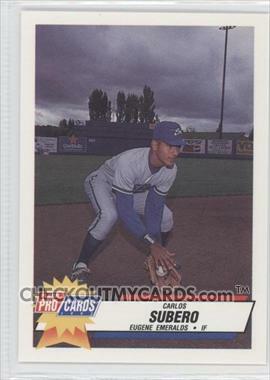 Infielder Carlos Subero played five seasons in the Royals, Pirates and Rangers organizations. He has since gone on to a lengthy career as a minor league manager, currently with the Dodgers AA team in Chattanooga. He kindly answered my questions about baseball cards. Once when I was a fan, a pitcher for Leones del Caracas in winter ball, called Don Heinkel, wrote John 3:16 on his baseball card. I was a kid and it impacted me that players could share their faith on a baseball card with a verse. Now a days is something I do. I used to be a big collector, even as a player, the first thing I would look up was where were the baseball card shops. I collected different ones, Ozzie Guillen was my favorite, Ozzie Smith, Tony Fernandez, Roberto Alomar and Eric Davis. Not anymore, but I do keep my collection in Venezuela, in great condition. This set does not appear to be affiliated with a major manufacturer. The set for this Cubs minor league team is sponsored by Toyota of Charlotte and Smitty's Baseball Cards, a long defunct baseball card store. The design and photos are both pretty generic. The trainer card is pretty interesting, though. This is not the future Braves catcher, but a guy who would end up being an assistant trainer for the Chicago Cubs in the early 90's, according to The Greatest 21 Days. "He is single and his interests include deep sea fishing, scuba diving, big game hunting, and girl watching." Look out, girls. Unlike some of the other Best sets, the Riverside Red Wave (Padres organization) has a lot of fun photos and interesting poses. Andy Skeels was born in New Zealand. Unlike Stephen Sharts, Mark Beavers's name was funny even during his playing career. Not a very glamorous location for your baseball card shot, Mr. Pitcher-Holding-a-Bat. I wonder if that is the duguout or bullpen. Either way, that little metal bench shows that these players are a long way from the big leagues. Even worse, pitcher Brian Harrison had his photo taken right outside the bathroom! 2-time World Series Champion manager Bruce Bochy in his first year as a coach. Another 1989 Best set, with a more diverse selection of photos then most. One of the most enjoyable aspects about collecting minor league cards is of seeing the long-time baseball veterans who bounced between the majors and minors, often in uniforms you're not used to seeing them in. It appears Steve Scarsone's card was taken in the locker room. Until the 2004 movie Along Came Polly, this guy had a nice, normal, if unusual, name. Somehow on the checklist they managed to misspell both coaches, whose names should be Aviles and Hart. Every card in this set pretty much looks like Yankees hitting coach Kevin Long here. Simple, waist-up head shot in front of the scoreboard. 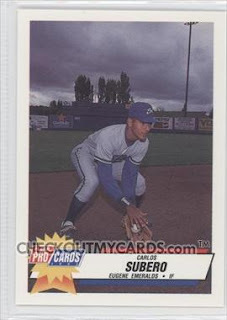 Still, for any fans of the Royals, Eugene, Oregon or just minor league baseball cards, I do have an extra set to trade. Here is what the front of a checklist card looks like in 1989 Best. And here is the back. For some reason the person who put together the checklist had a lot of trouble with Kerwin Moore.